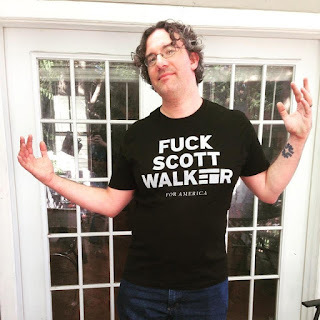 UNINTIMIDATED: Wisconsin Musicians Against Scott Walker: Shirts are here, and they're spectacular! If you ordered one before the end of August, it's going out in the mail to you Tuesday (tried to make it to the Post Office this morning but it just didn't pan out. Stupid late Packer games messing with my sleep!)! If you placed an order for one after Sept. 1, yours will be ordered on the next run October 1. Thanks to everyone for being patient! I work in customer service and know everyone wants their stuff shipped immediately, but this is the best way we can raise cash for our punk rock endeavor without putting our credit cards in excessive jeopardy. Anyway, watch for them soon, and please post photos of you wearing your shirt all over social media and tag our Facebook or Twitter handles in them! We're @unintimidatedsw on Twitter and Instagram and you can find our Facebook page here. Want a shirt of your own! Click on the "buy a t-shirt" link on this page or head right here to our bandcamp site! Next run will be ordered on Oct. 1!